It was just starting to get light outside, cars revving their engines to begin the morning journey to work. I hadn’t yet slept and walked the empty streets of Reykjavik, watching the thick clouds roll over the mountains in the breeze of an August dawn in 2014. This night, spent awake talking with my friend Haukur Hilmarsson, returned to me when it was announced earlier this month that Haukur had reportedly been killed in combat in Afrin several weeks before. 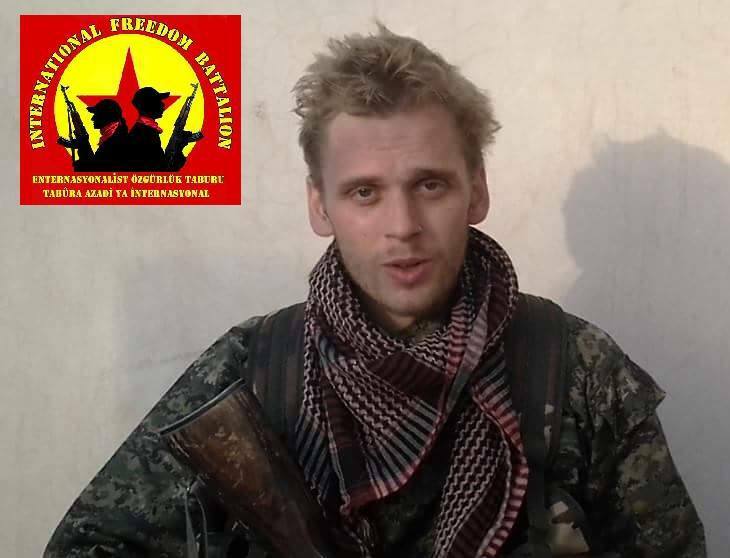 An Icelandic citizen, he is said to have travelled to Syria with the Revolutionary Union for International Solidarity (RUIS) to join the International Freedom Battalion (IFB), an anti-fascist brigade fighting with the People’s Protection Units (YPG) for the revolution of Rojava. On 11 March protesters in the UK occupied train stations across the country to draw attention to the deafening silence of the British media and government in response to the invasion of Afrin by Turkey. Many bystanders reportedly commented that they couldn’t see the connection between the UK and the situation in Afrin. Similarly, in the days following the news of Haukur’s death, I spoke with many who questioned why someone in Haukur’s position–namely, from the west and not Kurdish–would make the decision to travel to fight with the YPG. However, it is crucial that Afrin–and the seven year-long Civil War in Syria that has preceded it–is understood as having everything to do with the west. The UK government’s perceived public silence on the issue is, simply, a form of action. And it is one that was complicit in Haukur’s death and in the deaths of everyone who has lost their life in Afrin, many of whom had no choice but to fight. The UK’s silence may be deafening, but its foreign policy speaks volumes. For longer than a decade Haukur stood up for collective and individual rights in the face of national and foreign policy. He campaigned for environmental rights with Saving Iceland, taking part in direct actions against the development of power stations across the country. In 2008 he helped to stop the deportation of Paul Ramses Odour, then seeking asylum (now an Icelandic citizen), by physically blocking the plane on the runway. The extent to which Haukur contributed to political and social change cannot be measured through this list of actions, which only scratches the surface in reflecting the deep generosity and commitment he had to the struggle for a freer, fairer world. It is reported that Haukur first took part in combat against ISIS in Raqqa. After ISIS were driven out of the city, he travelled with the IFB to Afrin when Turkey began implementing ‘Operation Olive Branch’. The military operation includes airstrikes and artillery shelling, and seeks to gain control over and ultimately destroy Rojava as an autonomous and self-governing region, killing citizens en masse and decimating the land in the process. Haukur is by no means the only person to have travelled from the West to join the YPG in its struggle for liberation and its resistance to ISIS and the Turkish invasion. Hundreds of foreign nationals have been reported to have joined the YPG, drawing comparisons from groups such as the Kurdistan Solidarity Campaign to the role of international brigades during the Spanish Civil War. So far, two British citizens have been charged with “terror” offences on return to the UK, after travelling to Syria to fight with the YPG against ISIS. Whilst the UK’s stance on the YPG has been deemed “incoherent”, it has long been a direct supplier of arms to Turkey, providing it with the weapons that are being used to strike and shell Afrin during the very moments I write this. In May 2017 the British government negotiated a £100m deal in May 2017 to support Erdoğan to develop fighter jets and improve trade relations. Between July and September 2016, the UK sold Turkey £26m-worth of armoured plate, body armour and helmets; £8.5m-worth of aircraft equipment, helicopters and drones; and almost £4m-worth of licences for missiles, bombs and “counter-measures”. Western governments, and, by extension, corporations (or rather it is the other way round), have put in place and supported dictatorships and anti-democratic strategies all over the world, in order to create and maintain a capital-friendly environment, whilst eradicating any political or social resistance. This was spelt out clearly through one memo noted by Shell Nigeria that stated, “For a commercial company trying to make investments, you need a stable environment; dictatorships can give you that.” Here, “commercial company” can simply be substituted for “governments”. Both Conservative and Labour-led governments have consistently demonstrated a vested economic interest in foreign conflict, selling arms to Saudi Arabia, Iraq, Libya, Israel, Afghanistan and Eritrea. These countries make up a small number on a longer list of countries, two thirds of which are also noted by the UK to be “human rights abusers”. The list is extensive, from the arming of Saudi Arabia to carry out military operations killing thousands in Yemen, while “significantly enhancing” the military capabilities of ISIS, to the funding of war crimes during the Sri Lankan Civil War. However, the UK’s intentions exist beyond financial profit solely; they must also be understood as deeply political. Britain’s role in supporting fascist and anti-democratic regimes such as that of Turkey’s shouldn’t come as a shock to anyone aware of its centuries of imperialist foreign policy. To borrow from Stanley Diamond, Britain’s past and present understandings of “civilisation” have relied on pursuing “conquest abroad and repression at home”. As demonstrated solely through its response to Grenfell, and the treatment of people held in immigration detention centres, the UK government cares little for many living on its own soil, let alone those living across the borders it has taken part in chalking up for a large part of the world. Echoing the treatment of citizens from countries colonised by Britain and taken to fight on the frontlines in WW2, the UK has attempted to use the YPG as a pawn to fight ISIS on its behalf. This is while spending millions of pounds on strengthening borders in an attempt to prevent people fleeing the region from arriving to Europe, simultaneously providing a booming border security market for its arms and security industry. As noted, Britain has historically supported countries self-identified as “human rights abusers”, but it is critical that the UK is understood as an abuser of human rights itself through its direct complicity and vested financial and political interests. The government is making a conscious choice not to support Rojava, a region that prioritises egalitarian, anti-capitalist and feminist principles in the struggle for self-governing democracy. While some may not understand how Turkey’s invasion of Afrin is related to the UK, it is undeniably the product of an imperialist culture in which we participate in and profit from on a daily basis. UK state violence and oppression undertaken by the UK know no borders, and therefore any movement that seeks to challenge it must also be transnational. We must hold ourselves responsible for drawing attention to this in whatever ways we can. Organise and show up to protests. Support organisations like the Kurdish Solidarity Campaign. Take direct action against governments and businesses that prop up the Turkish regime. Carry the dream of a freer and fairer world as close to you as Haukur did. Since Haukur’s death, a 26-year-old British woman, Anna Campbell, has also been killed in Afrin. In reporting her death, the mainstream media has been accused of being ‘patronising‘, calling her actions ‘naive’ and ‘futile’ and largely ignoring the politics behind her choice to fight with the YPJ.